Children naturally know how to climb and scramble across obstacles, and our kids course gives them the practice of managing their own safety lines and movement while honing their physical skills. Unlike the full course for the adults, kids on their course can do up to three full loops of the course. There is one children’s course within our Park. This course is designed for children ages 7 to 11. Parents and observers can use the areas along the course that will allow you to walk and observe your child/children as they progress through the course. Each child is scheduled into a brief group training session that lasts up to a half an hour. 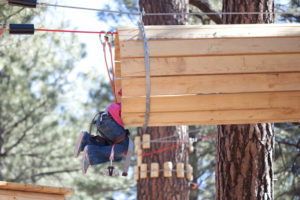 At the training session, the child will be fitted into a harness and Flagstaff Extreme’s Guides will show the child how to remain attached to safety lines and how to use the “child sized” zip lines. Once the child demonstrates that they can appropriately use the equipment, he/she will be able to proceed onto the YELLOW (Kid’s) course, supervised by the parent (or an adult standing in on the parent’s behalf) from the ground. Guardians must attend the training session (without equipment) along with the child and learn what to watch for in order to supervise the children in their care (don’t worry, it’s very straight forward). As well, in order to be able to reach the safety lines and manage their passage through the course, each Child is required to be able to reach the palm of their hand to a height of 4’7″ while keeping their feet flat on the ground. For the price of admission on the YELLOW Children’s Course, children can adventure through the entire course three times. We highly recommend making a reservation in order to ensure the places and times that you want on the course.